The best established of these innovations can be grouped under three general aims: 1) helping newcomers navigate local services; 2) getting them into work or training; and 3) providing access to community-based housing and services. 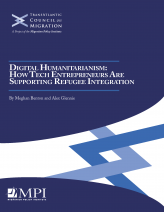 Yet this report finds that many new tools have failed to live up to their promise, in part because of extensive duplication in the sector, limited understanding of refugees’ needs, and funding and organizational limitations. The speed of the tech response has outpaced policy debate, and many digital efforts are poorly connected with traditional, offline services or with mainstream policy, the authors find. Policymakers could better channel the streams of innovation by identifying particular problems that could benefit from a tech solution, foster support for the most promising innovations with follow-up funding or incubation support, and invite tech entrepreneurs into integration policy discussions, among other recommendations.